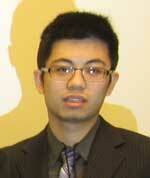 Iowa State transportation engineering student Bo Wang has been awarded the first Tom Maze scholarship. Wang is a PhD student who also received his M.S. and B.S. degrees from Iowa State. His major professor is Shauna Hallmark. The Tom Maze scholarship was established in the memory of Professor Tom Maze, whose vision was instrumental in establishing the transportation research center at Iowa State that has grown into the Institute for Transportation. The scholarship was open to current PhD students in transportation engineering with at least one year in their programs of study. While he never met Dr. Maze personally, Wang believes his legacy lives on at Iowa State and InTrans. “Dr. Maze reminded us that transportation research is not about the number of papers we publish, but the impact we make into society and other people’s quality of life,” says Wang.